"Welcome back AMS Alumni! Let us know how you're doing—send us an email or, better yet, stop by in person." Please visit our Support Us page to learn how you can help the AMS program continue to provide an excellent education for our students . "[If I had been admitted] into the Strategic Communications program, I would never have found the American Studies program and Dr. Hamlin." 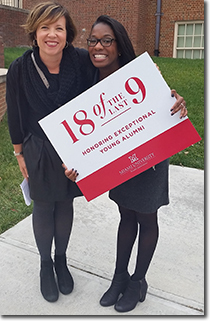 Taylor Robinson '09 (right) celebrates her 18 of the Last 9 Young Alumni Award with Kimberly Hamlin (left). Read more about Taylor.